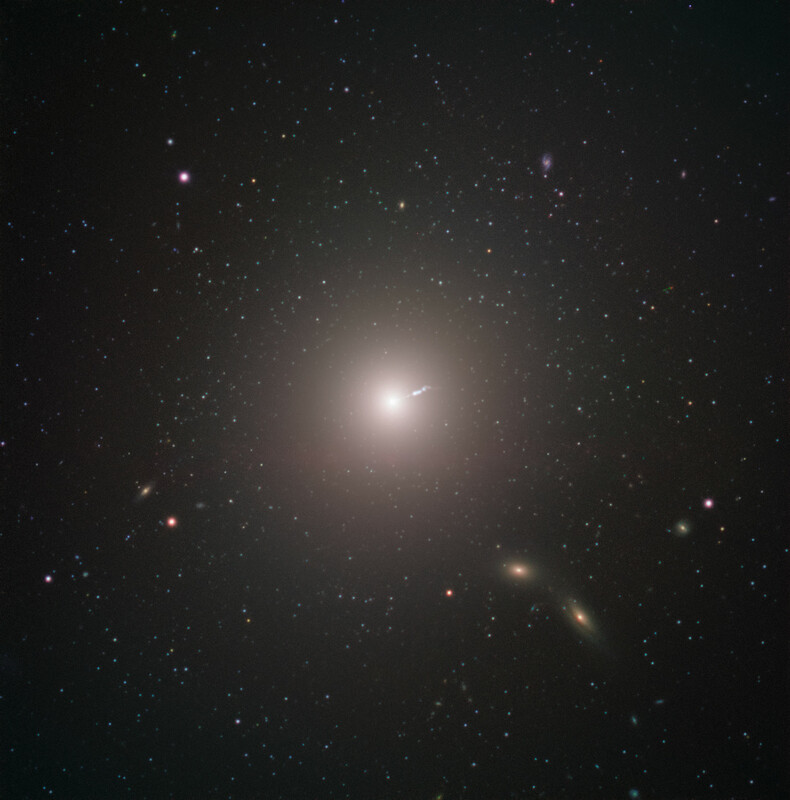 Messier 87 (M87) is an enormous elliptical galaxy located about 55 million light years from Earth, visible in the constellation Virgo. It was discovered by Charles Messier in 1781, but not identified as a galaxy until 20th Century. At double the mass of our own galaxy, the Milky Way, and containing as many as ten times more stars, it is amongst the largest galaxies in the local universe. Besides its raw size, M87 has some very unique characteristics. For example, it contains an unusually high number of globular clusters: while our Milky Way contains under 200, M87 has about 12,000, which some scientists theorise it collected from its smaller neighbours. 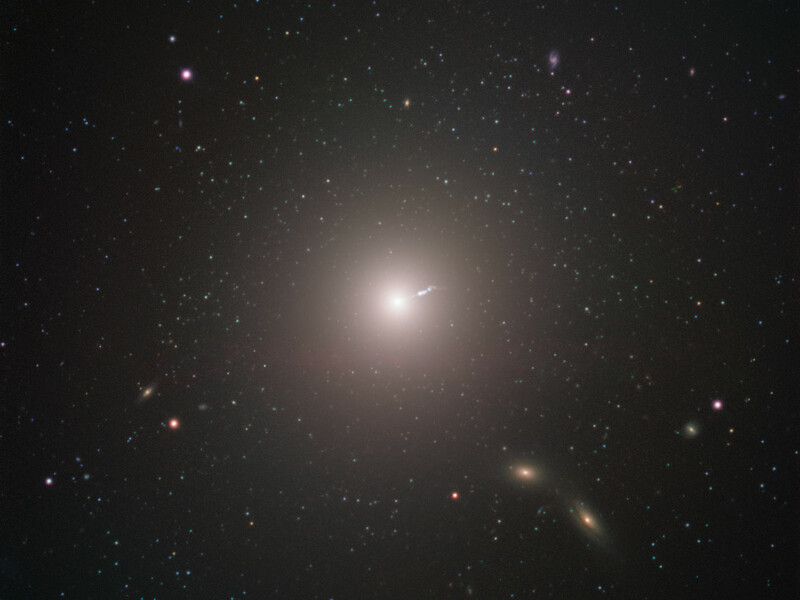 Just as with all other large galaxies, M87 has a supermassive black hole at its centre. The mass of the black hole at the centre of a galaxy is related to the mass of the galaxy overall, so it shouldn’t be surprising that M87’s black hole is one of the most massive known. The black hole also may explain one of the galaxy’s most energetic features: a relativistic jet of matter being ejected at nearly the speed of light. The black hole was the object of paradigm-shifting observations by the Event Horizon Telescope. The EHT chose the object as the target of its observations for two reasons. While the EHT’s resolution is incredible, even it has its limits. 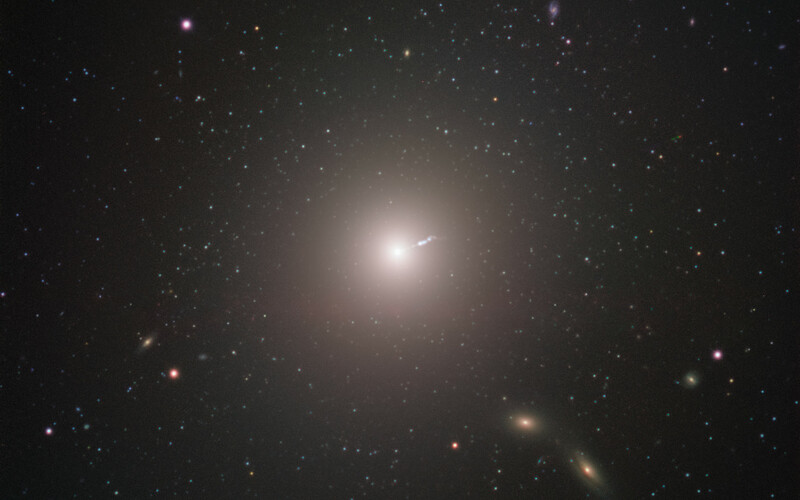 As more massive black holes are also larger in diameter, M87's central black hole presented an unusually large target—meaning that it could be imaged more easily than smaller black holes closer by. The other reason for choosing it, however, was decidedly more Earthly. M87 appears fairly close to the celestial equator when viewed from our planet, making it visible in most of the Northern and Southern Hemispheres. This maximised the number of telescopes in the EHT that could observe it, increasing the resolution of the final image. This image was captured by FORS2 on ESO’s Very Large Telescope as part of the Cosmic Gems programme, an outreach initiative that uses ESO telescopes to produce images of interesting, intriguing or visually attractive objects for the purposes of education and public outreach. The programme makes use of telescope time that cannot be used for science observations, and produces breathtaking images of some of the most striking objects in the night sky. In case the data collected could be useful for future scientific purposes, these observations are saved and made available to astronomers through the ESO Science Archive. Position (Dec): 12° 23' 29.38"